Turf vs seed, the pros and cons of turf and seed for making a new lawn. In Autumn and Spring thoughts turn to lawns. Whether you’re starting a new lawn from scratch or adding to an existing one, you face the same dilemma. Should you opt for the quick fix of turf or take your time and grow it from seed? Which? Gardening took two identical areas that had previously been set up as typical small gardens (about 36 sq yd). Each featured a central path and was surrounded by fences and hedges. 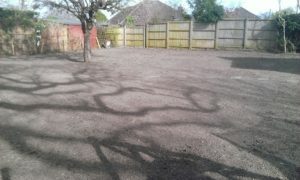 The soil in both gardens was cleared and prepared, then one was seeded and the other turfed. The progress of both lawns was monitored for two months, with both patches mowed when necessary. Arguments for: Once you’ve laid it, watered it and trimmed the edges turf looks good straight away, the joints knit together and you can sit on it after a week or so. Cutting and fitting turf was a very satisfying job. Against: Expense. 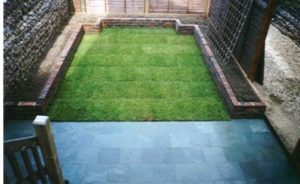 Top-quality turf costs £130 for 36 sq yd – in this case Rolawn , which is available nationally and delivered to your door. You may find good quality turf locally for less. The rolls of turf were fairly heavy and awkward to move – worth bearing in mind if access to your garden is restricted. Laying turf is more labour intensive than seed and it took about 40 minutes to complete the garden (not including soil preparation), but this included trimming the edges. Buying tips: When choosing turf, unroll a few turves and check the quality. Turves should be even thickness, and between ½in and ¾in thick. The grass should be dense and mid to dark green with no yellow or brown patches. The turves should hold together when lifted carefully and the underside should be moist. Reject any poor quality turf that is dry or shrivelled, looks diseased or contains weeds. Arguments for: By far the cheaper option. Using a Best Buy grass seed cost just £14 for 2kg, with some left over for over-seeding gaps later. And once the ground had been prepared, it was quick and easy to sow. It took about 10 minutes to sow and rake in. Against: Seed was sown in mid-May. Although the first shoots appeared quickly it took six weeks and several cuts before it began to resemble the turf lawn. To prevent the local wildlife helping themselves to the seed, the area had to be netted after seeding, which was another hassle. It took six weeks for the lawn to bind together before we could cut the edges and we also had to reseed some sparse patches. It was much easier for weeds to invade the seeded lawn than when we used turf, given that there were a few bare patches. If you have a small area and a bit of money to spare, turf is the quickest and easiest option. For larger areas seed is much cheaper, but be prepared to wait before you can use your lawn.